Some people watch football on Super Bowl Sunday, others smoke crazy-potent bowls of Super Blue Dream. I just wanted to let everyone know that I smoke weed during the Super Bowl. Thank you. Goodnight. But anyway, either way, almost everyone spends Super Bowl Sunday eating super-dank food, which is why I asked Dana Hunnes, senior dietitian at the Ronald Reagan UCLA Medical Center, to help me rank popular Super Bowl snacks — from potentially healthy to the ones that will make your toilet look like they got hit by a… football… tackler guy? I also don’t know anything about football, thank you, goodnight again. As for the unhealthy dips, “Artichoke dip and onion dip are usually sour cream mixed with artichoke hearts and onions,” Hunnes explains. “They contain a lot of [artery clogging] saturated fat and [tumor promoting] casein, as well as a lot of calories without much benefit.” Lastly, it will probably not surprise you that Hunnes says queso is the least healthy dip. “This is high in saturated fat, casein, calories and salt — it’s not healthy,” she emphasizes. Unfortunately, the same can be said about the vast majority of popular Super Bowl snacks. “There aren’t many items on this list that could be considered the least bit healthy in their ‘typical’ form,” Hunnes says. 1. Veggie Platters: Vegetables are obviously healthy. Next! 3. Pizza: Hunnes says pizza earns third place, since veggie pizza can be healthy. 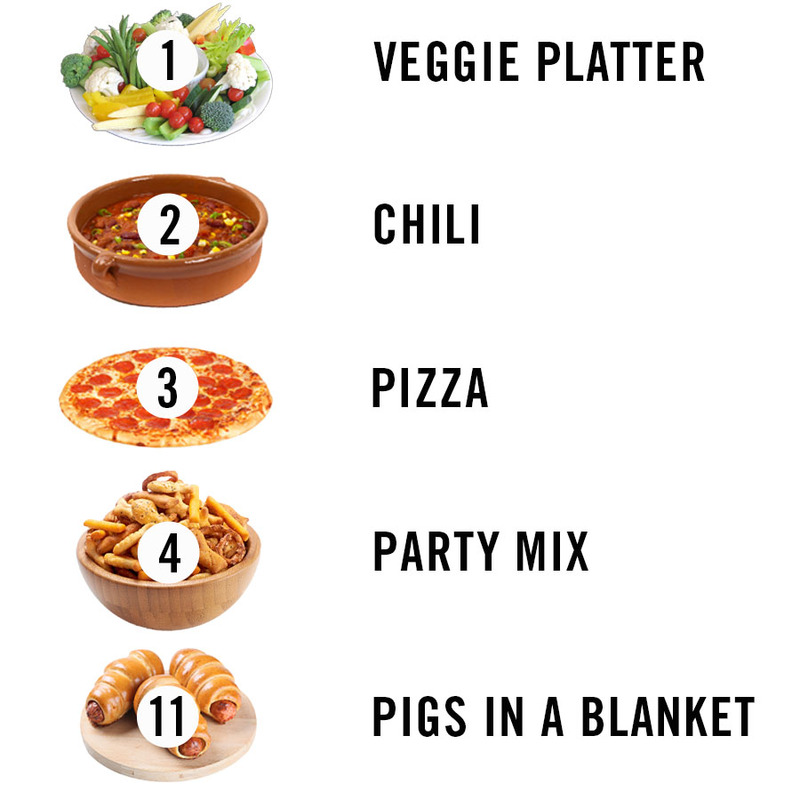 But she also mentions that meat-lovers pizza is “terrible for you.” So if you want to build a healthy (or somewhat healthy) pizza for your Super Bowl party, check out our previous ranking of popular pizza toppings. And for the love of God, avoid the frozen kind, they’re all terrible. 4. Party Mix: “This is mostly white flour and salt,” Hunnes says, both of which aren’t very healthy. But on the plus side, Hunnes explains, “You can usually only eat so much before getting flavor fatigue.” All of which means, so long as you don’t eat an entire bag of the stuff, party mix isn’t too bad. I guess all that explains why the bowl in my bathroom doesn’t look so super by the end of the day.